Control isn’t everything. That’s the conclusion foreign insurance companies operating in India appear to have reached. Overseas giants are taking advantage of a recent relaxation of ownership rules to lift their shareholdings in local insurance joint ventures to 49 percent – the maximum allowed. With little prospect of increasing their stakes further, that means tying up more capital in minority positions. This week Asian insurer AIA lifted its stake in its joint venture with Tata Sons from the previous regulatory limit of 26 percent to 49 percent for an undisclosed sum. A week earlier, Canada’s Sun Life paid around $250 million to boost its share of its joint venture with the Aditya Birla Group. Axa, the French multinational, and Japan’s Nippon Life Insurance have struck similar deals with respective partners Bharti Enterprises and Anil Ambani’s Reliance. It’s not usually attractive to own a large minority stake in a business when there is no obvious path to control. Even if India were to relax its prohibition on foreign ownership further, overseas groups might struggle to find willing sellers. Most insurers have joined forces with prominent family-backed conglomerates. While that has helped them to grow quickly, Indian industrialists don’t tend to give up control of businesses unless forced to do so. There is plenty still to play for, though. The value of Indian life insurance premiums is equivalent to just 3.2 percent of GDP. That ratio has fallen in recent years due to a weak economy and regulatory changes. As such, many companies in the capital-intensive industry have not raised funds and growth has further suffered. With economic conditions improving, the industry could expand to 5 percent of GDP by the end of the decade, KPMG reckons. In mature Japan, the share is almost 10 percent. Bigger shareholdings will also help foreign groups retain some influence if the ventures go public. HDFC Bank has already indicated a desire to pursue an initial public offering for its insurance joint venture. Others like State Bank of India are expected to do the same. To maintain some exposure to one of Asia’s biggest markets, foreign insurers have to be willing to take a backseat. 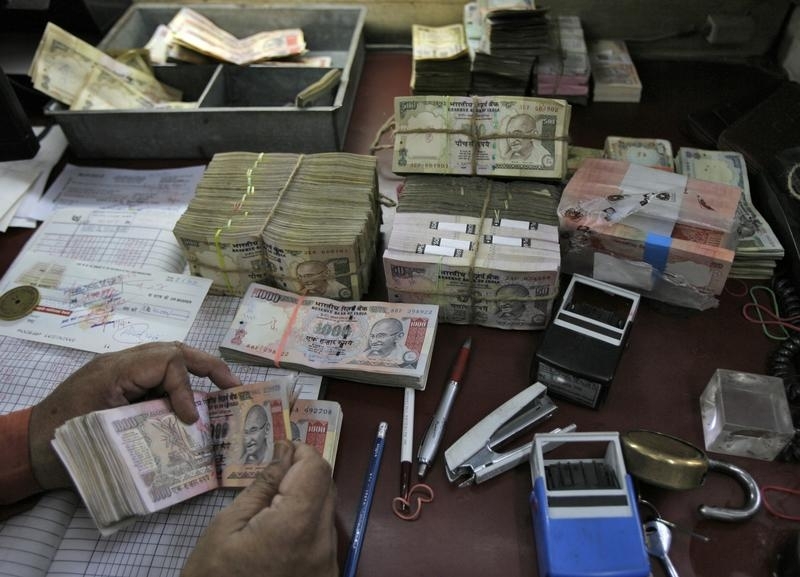 An employee counts Indian currency notes at a cash counter inside a bank in New Delhi. AIA Group agreed to raise its stake in its Indian life insurance joint venture from 26 percent to 49 percent, local partner Tata Sons said on Dec.7, without providing further details. A week earlier, Canada’s Sun Life Financial said it would lift its stake in Birla Sun Life from 26 percent to 49 percent by buying more shares from Aditya Birla Nuvo. Sun Life will spend 16.6 billion rupees ($249 million) on the purchase, the companies said in a statement. On Nov. 24, Japan’s Nippon Life Insurance said it had agreed to pay around $342 million to raise its stake in Reliance Life from 26 percent to 49 percent. In March, India raised the foreign ownership limit on the insurance sector to 49 percent.